Could we have a star closer than Alpha Centauri hidden by dust? I haven’t read Nemesis, so here’s my googled summary of the situation you’re referring to. In Nemesis, one of the characters discovers a previously unknown red dwarf star, only two light years from the Earth. This star is dubbed Nemesis, and, in the book, is on a path to mess with the orbit of the Earth such that the population of Earth needs to move. Here’s the thing with both dust clouds and red dwarfs - they’re not totally invisible. A red dwarf star is fairly bright in the infrared, as dim as it might be in the optical - it only produces a little light that we can see, but far more as heat. If the star weren’t obscured with dust, it would be easily spotted by one of our all-sky surveys, as a weird bright source moving across the sky. Barnard’s Star, which is nearly 6 light years away, visibly moves through the sky - the gif below shows its motion over a 20 year period. There are a number of surveys hunting for moving objects, and though their primary target is usually asteroids, they’d still pick up on something like this. This motion means that the star can’t be coincidentally behind a convenient dust cloud that happens to be along the line of sight between us and that star. It would quickly move out from behind the blocking cloud. (As a further point, our solar system isn’t in an area of the galaxy that’s particularly full of dust clouds, so it’s unlikely it would have anything to hide behind in the first place. In any case, this means that if we’re going to have a star buried in dust and therefore invisible, it’s going to have to be carrying the dust with it. The easiest way for that to happen is if it never got rid of the dust cloud that it formed in - however, red dwarf stars are usually extremely old, and would have had time to burn away the dust that surrounds them, so this is also unlikely. Even if it did somehow have a cloud of dust surrounding it, dust glows, if you’re looking at the right wavelength. 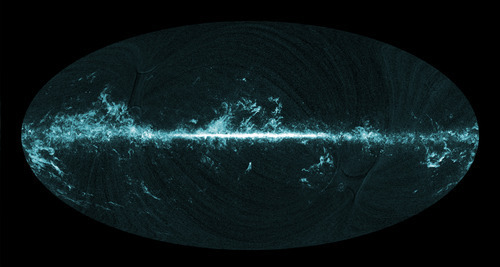 The image below is the glow of carbon monoxide in our galaxy as taken by the Planck space telescope. Carbon monoxide only exists in very dense clouds of gas, the sort of dense cloud you need if you want to form new stars - any less dense and the molecule will be destroyed. We should be able to spot anything that’s very dense through one of these maps, if we hadn’t noticed it through its motion. So I would say that the odds are pretty low that there’s a surprise red dwarf anywhere near our solar system. The odds are much higher that we’ll run into danger from within our own solar system - asteroids which cross the orbit of the earth are pretty common. “Dwarf” was originally a term used to distinguish between the two kinds of red stars in the universe - very massive, and very small. These were termed “red giants” and “red dwarfs”. 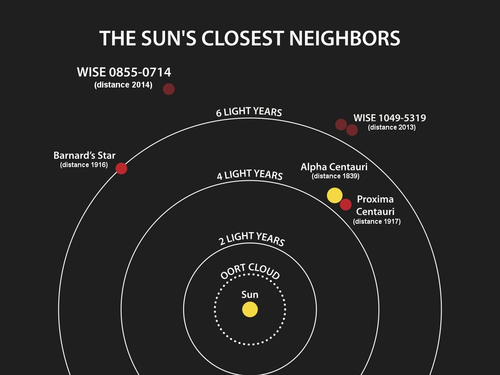 The dwarf terminology gradually expanded to mean “not giant” stars of any colour, and the line between “giant” and “dwarf is somewhat poorly defined; the Sun is technically a "yellow dwarf” star. Yellow and red dwarf stars are normal stars - they burn hydrogen in their cores and live on the main sequence of stellar lifetimes. Red dwarfs are smaller than our sun, only getting up to 50% the size of our sun. As a result, their surfaces are cooler, hence the colour shift towards the red. They don’t consume their hydrogen as quickly as our sun does, so even though they’re less massive and thus have less hydrogen, they still live for a much longer time than our sun will. Because red dwarfs require less matter to create, they are the easiest to make. Red dwarfs are therefore the most abundant type of star in the galaxy - our nearest stellar neighbor is a red dwarf. Brown dwarfs are failed stars. They’re essentially massive Jupiters - large collections of gas that are not massive enough to create the pressures required to start burning hydrogen into helium. These dwarfs can be pretty cold; there was one found not too long ago that was only as warm as a cup of coffee. A brown dwarf can’t do anything except sit there and slowly radiate away its heat - it won’t ever become a fully fledged star. The iron rain you refer to was the conclusion of a study from 2006; evidence was found that at the temperatures of the star they were looking at, the iron they detected in its atmosphere should be forming liquid droplets and raining down towards the surface of the star. Further studies have found evidence for massive, Jupiter-style storms in the atmospheres of these stars. The behavior of the metals and other elements in a brown dwarf’s atmosphere will depend strongly on the temperature of the star in question. 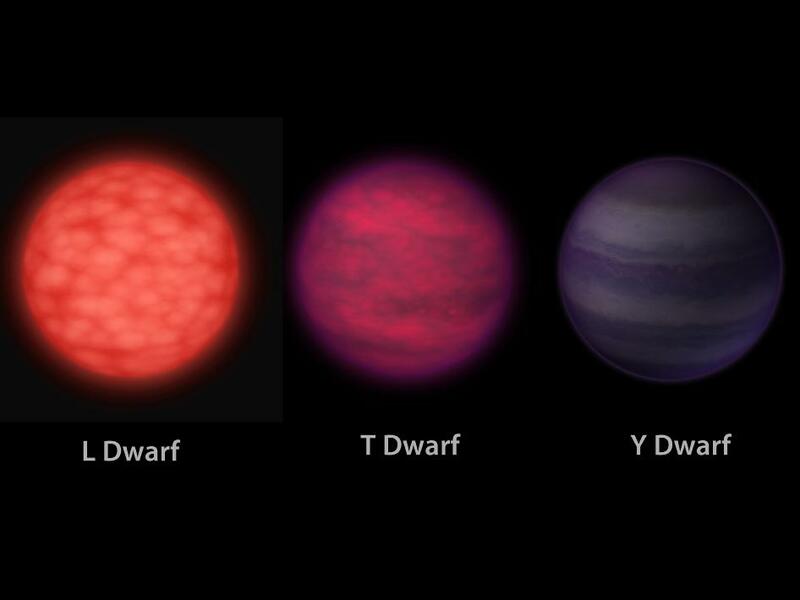 Since “brown dwarf” is a rather broad term, some of these stars will be too cold for iron rain, and some will be too warm. Of course, the presence or absence of a particular element will depend on the gas the dwarf formed out of, since the brown dwarf is not building any new elements itself. White dwarfs are the most exciting to make. They are what is left over after a main sequence star (like our Sun) dies. The star will have gone through the red giant phase, and then shrugs off its less dense outer layers into a planetary nebula. At the end, all that is left is a hot, dense core of what was once the centre of the star in a volume about that of the Earth. They are so dense that the pressure provided by the electrons of the atoms within the star pushing against each other is what keeps them from becoming any smaller, and so hot they glow white just from trapped heat. This is the end-point of our Sun. The black dwarf - still a theoretical object - is the name we would give to a white dwarf star which had managed to completely lose all of its heat, effectively going completely out. The length of time it takes for a white dwarf star to lose all of its heat is longer than the length of time the Universe has been around, so we don’t expect to see many of these around.